Every parent anticipates the birth of a healthy baby. However, a minority of newborns (1 in 4000) may suffer from ‘inborn Errors of Metabolism’ (IEM), which if left undetected and untreated, could significantly affect the long term health and development of the child. 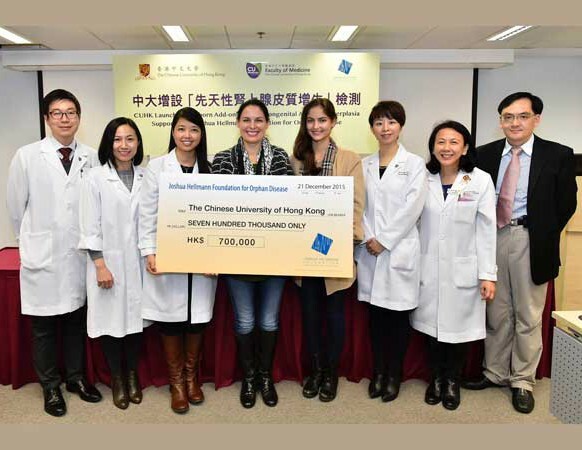 To this end, The Chinese University of Hong Kong (CUHK) now offers an expanded newborn screening program which can provide early detection of an extensive range of metabolic diseases previously untested for in Hong Kong. 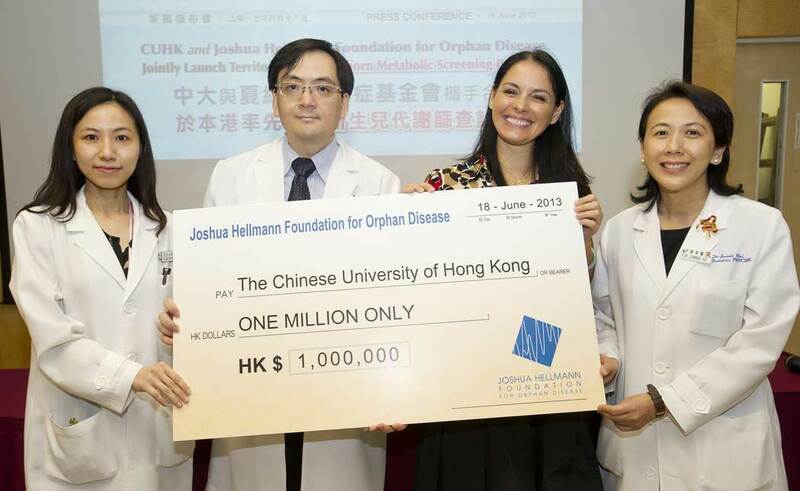 More than 56,000 babies had been screened in JHF-Newborn Metabolic Screening Programme since July 2013. From November 2017 onwards, we accept all newborn babies including preterm babies, to join the newborn metabolic screening programme. 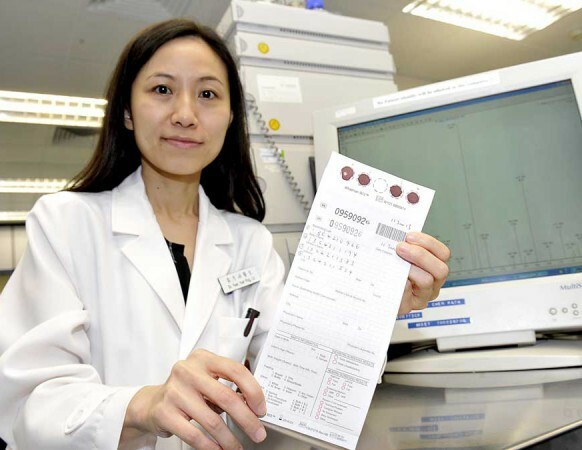 Our newborn screening programme provides newborn metabolic disease screening, congenital adrenal hyperplasia screening, and cystic fibrosis screening. 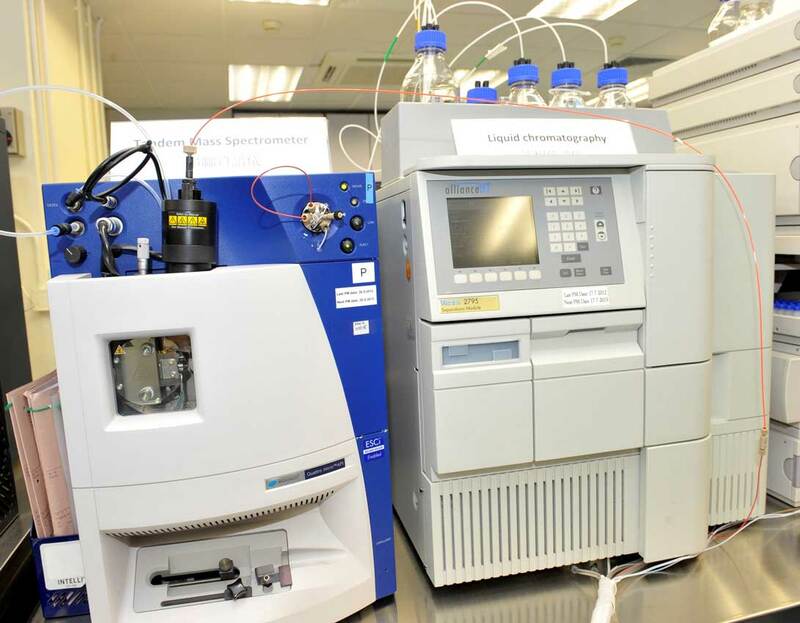 Babies with inborn errors of metabolism are identified and follow up at the paediatrics metabolic clinic. For interested parents, please contact us at 5569 6412 during office hours within 7 days after baby is delivered. Private clinic (Paediatrician) referral are accepted with prior logistics arrangement. Please refer to the latest protocol (protocol_v8) for further detail. 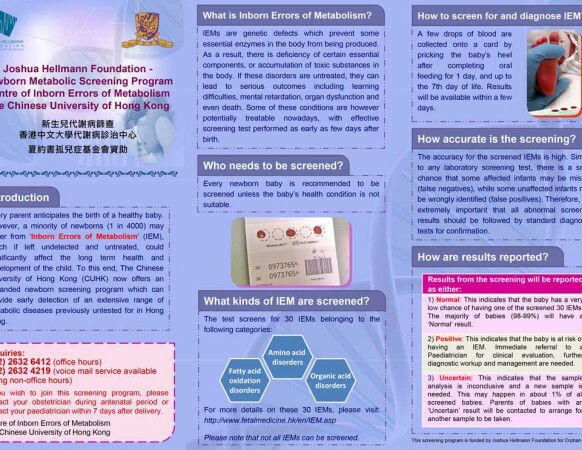 What is Inborn Errors of Metabolism? IEMs are genetic defects which prevent some essential enzymes in the body from being produced. As a result, there is deficiency of certain essential components, or accumulation of toxic substances in the body. If these disorders are untreated, they can lead to serious outcomes including learning difficulties, mental retardation, organ dysfunction and even death. Some of these conditions are however potentially treatable nowadays, with effective screening test performed as early as few days after birth. What kinds of IEM are screened? 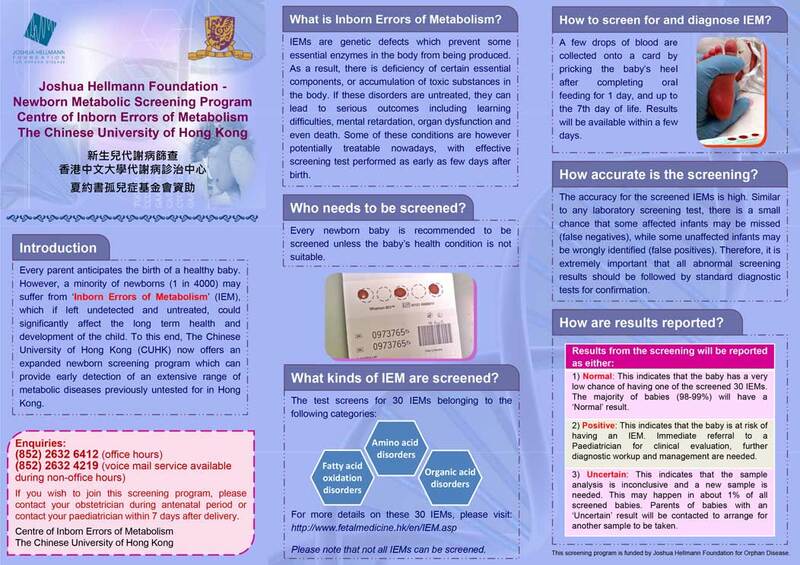 Please note that not all IEMs can be screened. Every newborn baby is recommended to be screened unless the baby’s health condition is not suitable. How to screen for and diagnose IEM? 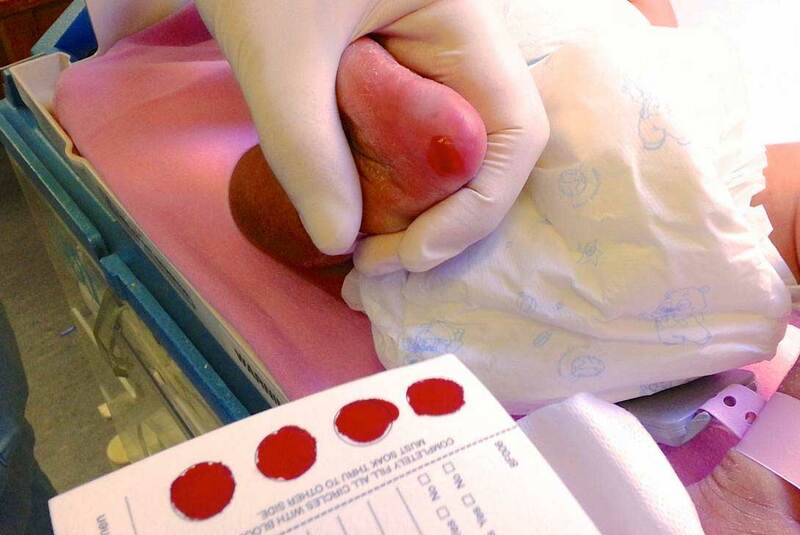 A few drops of blood are collected onto a card by pricking the baby’s heel after completing oral feeding for 1 day, and up to the 7th day of life. Results will be available within a few days. The accuracy for the screened IEMs is high. Similar to any laboratory screening test, there is a small chance that some affected infants may be missed (false negatives), while some unaffected infants may be wrongly identified (false positives). Therefore, it is extremely important that all abnormal screening results should be followed by standard diagnostic tests for confirmation. This indicates that the baby has a very low chance of having one of the 30 IEMs. The majority of babies (98-99%) will have a normal result. This indicates that the baby is at risk of having an IEM. Immediate referral to a Paediatrician for clinical evaluation, further diagnostic workup and management are needed. This indicates that the sample analysis is inconclusive and a new sample is needed. 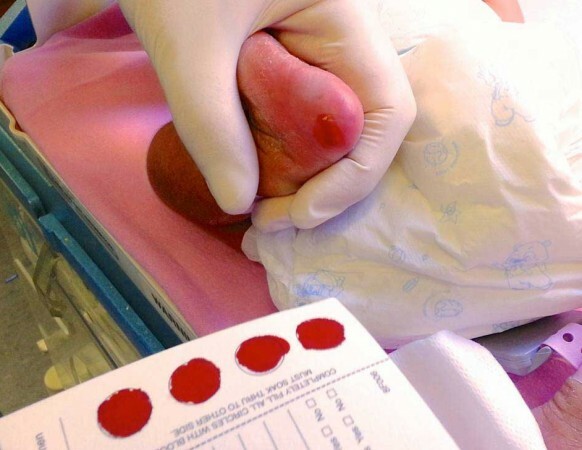 This may happen in about 1% of all screened babies. Parents of babies with an ‘uncertain result’ will be contacted to arrange for another sample to be taken. Why do we do it on blood? 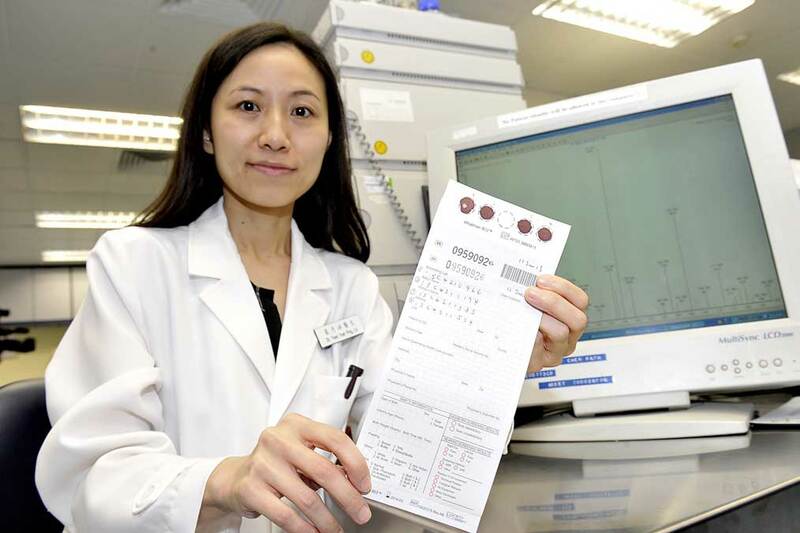 We may see slightly abnormal newborn screening results in healthy babies. We call them false positives. Babies with such results have to undergo further confirmatory investigations including blood tests and urine tests to rule out the condition. Therefore false positive results create enormous anxiety to parents. Some IEMs have onset later in life and are untreatable. Making the diagnosis too early only creates insurance issue and psychological burden to the family. Some IEMs are very mild and does not require treatment or long-term follow-up. Some important IEMs (e.g. carnitine uptake defect) only produce abnormal metabolites in blood. 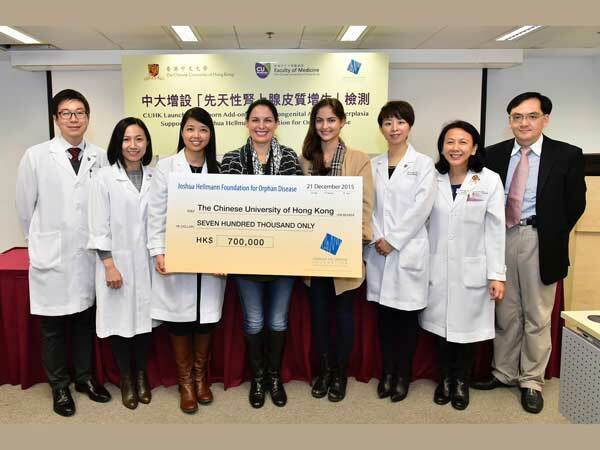 To request collection cards and request forms please call (852) 3505 4219 (Ms. Mak) or email pdc‑obg@mailserv.med.cuhk.edu.hk. 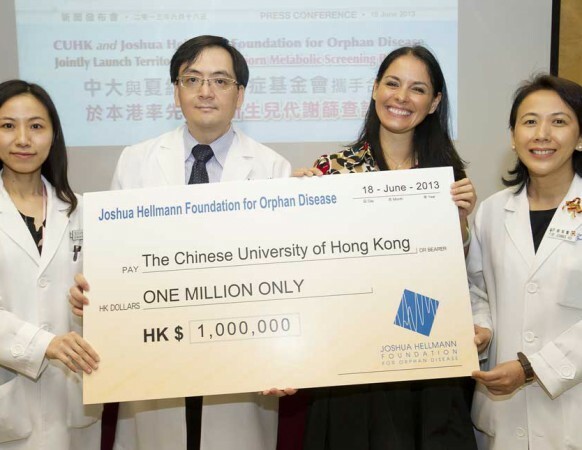 The screening program is funded by Joshua Hellmann Foundation for Orphan Disease. It commenced in July 2013.